I heard about the PassionForFashion competition and decided to submit my entry. We were asked to put together 5 different autumn/winter looks; party, casual, outdoor, first date and office wear. 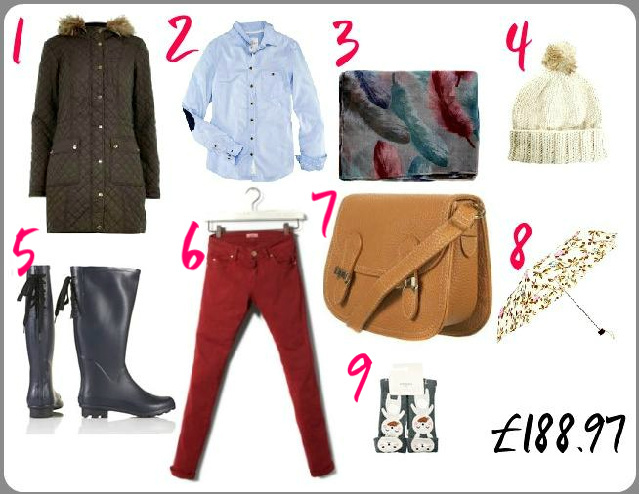 All looks must be under £200 and they should also include shoes and accessories. I present my looks below. Red is a fabulous statement colour, but it is also an autumn colour. It is a great colour to be seen in when heading out to any upcoming autumn/winter parties. I have paired up the dress with a lovely frayed jacket which is similar to the tweed styles that are currently in stores at the moment. The gold jewellery gives it that extra burst of colour with a statement envelope clutch to match. The metal toes on the shoes, the barb spike earrings and the bracelet, gives the look an "edgy" feel without going over the top. I will always be a fan of bright red nail polishes and what better way to complete the look than with this gorgeous shade by Barry M. I also make sure I take a scarf with me when I'm out just so I can get rid of the jacket and still have something to keep me warm if necessary. 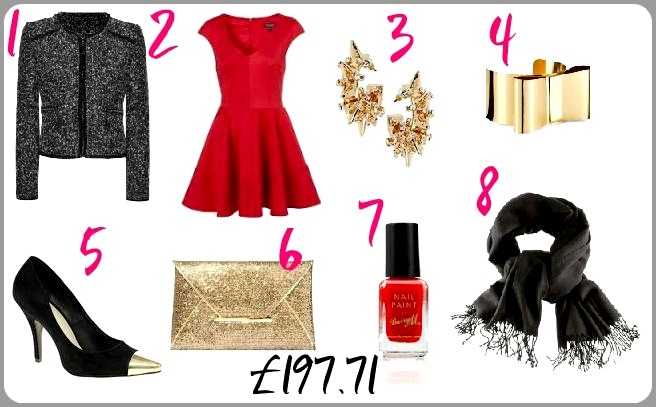 The total look is £197.71 which is more than reasonable considering the fact that you have got a dress, shoes, jacket, jewellery, bag and a scarf! I would definitely rock this outfit to any party. I chose this relaxed look for when you're heading out to the cinema or for brunch. Basically when you're not required to make too much of an effort. The green dress is definitely a colour for autumn. I teamed it up with 50 deriner black tights and the studded ankle boots which are in this season. The look is finished with a quilted biker jacket and lovely simple warm berry cashmere scarf to keep away that autumn breeze. As it is a casual look, jewellery has been left to a minimum. The fringed tote bag adds extra style to the outfit. The dress is definitely a bargain coming in at £12.99 and all the extra pieces really create the outfit. Once again, I think for £179.76 it is definitely worth a look. 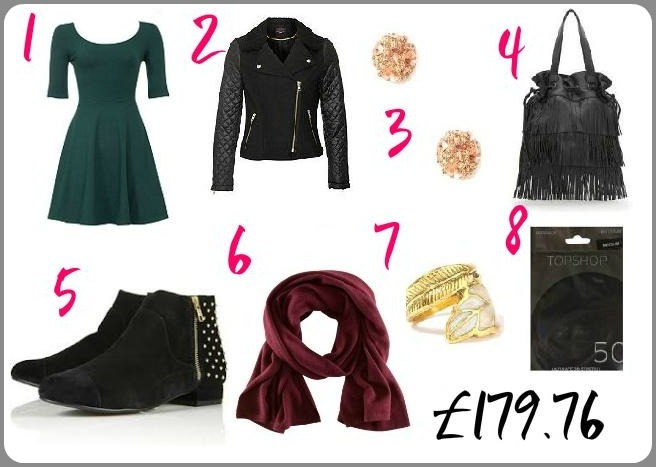 The cashmere scarf, the stud boots and the biker jacket are also a bargain compared to other high end brands. With this outfit, I just pictured what I would wear for a walk if the weather was wet, cold and the air crisp. The quilted parka is definitely needed when battling cold temperatures. It is still a casual yet stylish look. The red jeggings and the blue shirt compliment each other and are comfortable (which is what you want when you are out). The crossbow bag is necessary if you will be out and about so your hands are free. The feather print scarf adds a little touch of style to the outfit with a beanie to keep your head warm. The anti slip socks and the wellies go hand in hand if you are out walking. I had to add an umbrella as I am of course in the UK! Once again, I think the total price is a good offer as you could end up paying 3/4 of that price just for a parka jacket at some high street stores. Deciding what to wear on the first date solely depends on where you are going. I would wear this outfit to a nice relaxed daytime or evening date when you don't have to dress up too much. As it's a first date, you also don't want to look like you've made too much of an effort. The lovely tie neck pleat dress is a gorgeous warm autumn shade. I have teamed it up with mini polka dot tights which adds a girlie touch to the dress. The lace up boots are comfortable yet and give you that height you would want if you were wearing heels making your legs appear longer in the dress. The coat is the same cut as the dress giving you that feminine look. Jewellery has been kept simple. The scallop edge satchel and the purple nail polish finish off the outfit. At £182.02, you have also bagged yourself a great winter coat! I think this is an extremely elegant autumn office wear. The tailored trousers and the tailored blazer really add class to this outfit. The crip white shirt brings out the colour of the blazer. The simple gold earrings add to the understated style of this outfit and compliments the gold buttons on the blazer. The pale pink foulard adds a sprinkle of warm colour to the look. The gorgeous high heels will give the appearance of longer legs (which I always love). The look is finished with the Zara Office City Bag and a pop of colour is added to the nails. I like to call this look the "No Nonesense Look". I think when you wear it, it gives off the impression that you mean business. £190.90 may seem on the higher end but I prefer looking at longevity and the useful life of the items. I hope you have enjoyed reading and seeing the looks I have chosen. As mentioned earlier, this challenge was set by http://www.moneysupermarket.com/home-insurance/passion-for-fashion/ It would be great to hear your thoughts on my picks. Love the outfits!! I can't even pick a favourite, I love them all! We have the same style. Love how all the outfits are so feminine. Some are casual and simple, but still feminine.